*Please note that occasionally Jungle John will not be one of the above venues as advertised – he does take an occasional day off! Be assured one of his other talented balloonatic friends will be filling in for him! Fill out the “Online Booking Request Form” and we will contact you within 24 hours to discuss pricing and availability. If you don’t see what you’re looking for, please let us know – we will be happy to discuss a custom show for your event. Jungle John® Entertainment is proud to introduce the newest member of our Jungle Family……Dolly the baby Tyrannosaurus Rex! She is 12 ft. long and 8 ft. high, and is guaranteed to delight audiences of all ages! 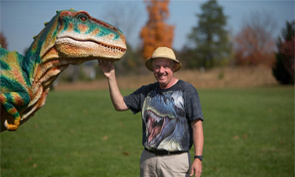 Dolly the T-REX is available for all occasions and events: libraries, schools, day cares, nursing and retirement homes, private parties, corporate events, TV & movie appearances – you name it! Liven up your next event with “edutainer” Jungle John’s Reptile Show! Guinness World Record Holder & Ripley’s Believe It Or Not! 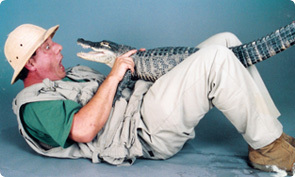 TV personality Jungle John, along with “Wally Gator” the American alligator, “Larry” the boa constrictor and his other “friends” have been delighting audiences ages 1-100 since 1988 with this entertaining and educational show! Jungle John presents an educational and fun show, including the animals mentioned above and about 10-12 others from the reptile and insect world (nothing dangerous or poisonous). The show lasts for 40-45 minutes; the last 15-20 minutes of the hour are spent giving the audience an opportunity to be “hands on” with the alligator or the snake. 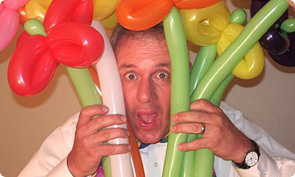 The Man-Eating Balloon Show is a 45-minute comedy/magic balloon show with lots of audience participation. Highlights include a mind-reading rabbit, a floating table and a lucky volunteer “transformed” into a duck! For the grand finalé, Jungle John climbs inside a giant 6-foot round balloon. This show is popping with fun! 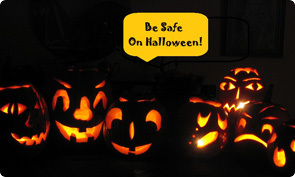 Be safe and have fun during the Halloween season! Ideal for day cares, schools, libraries, etc. This high-energy show, with lots of audience involvement, includes many funny & “frightfully exciting” things, including: A floating cyclops eye! Forgetful Frankie! Spooky the Magic Wand! A magical vampire bunny! Blended in are plenty of trick-or-treat safety tips about costumes, flashlights & bags, traveling in groups and with adults, candy safety and more! NEW! Running out of things to do with the kids during those cold winter months? Let Jungle John entertain them with his new Winter Wonderland Magic Show! 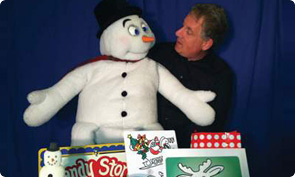 Comedy – Magic – Balloons and FROSTBITE the Snowman! Lots of audience participation! Copyright © 2015 Jungle John. All rights reserved.